Resting in the heart of River Oaks under a canopy of oak trees, this timeless custom home pays homage to Old-World European architecture. The current owners enlisted Robert Dame to design the residence which was completed by Parker House in 2016. Architectural consultant and designer, Sarah West curated a collection of historical architectural antiques and modernist details throughout all of the home’s interiors and furnishings. Soaring ceilings and glass creates an alfresco experience as you move through the home and enjoy the water features, flowers and foliage. 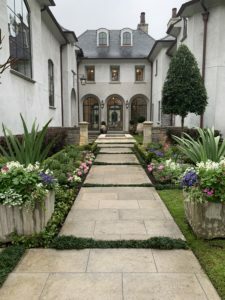 Oasis Landscape Architects designed the pool and gardens surrounding the home for the homeowners to entertain year-round. An enchanting guest house sits at the back of the property and hosts a private garden to welcome visitors.